Died: May 2, 2005 in Operation Iraqi Freedom. Unit: Marines, Marine Fighter Attack Squadron 323, Marine Aircraft Group 11, 3rd Marine Aircraft Wing, Marine Corps Air Station Miramar, CA. 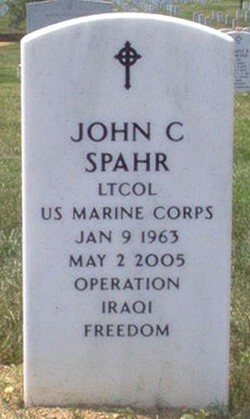 Lt. Col. John C. Spahr was killed in action in Iraq. He had lived in San Diego, Ca. Son of the late Ronald C. Spahr. He was the 1981 graduate of St. Joseph's Prep and 1988 graduate of the University of Delaware with a Masters of Science in Physiology. Survived by his beloved daughter Chandler Marie, his mother Eileen(nee Kelly) of Cherry Hill, NJ, his sisters, Kelly A. (Frederick)Sutter and Sabrina M.(David)Lawrence, Tracy S.(Brian)Harrington and his brother Stephen P.(Maria)Spahr. 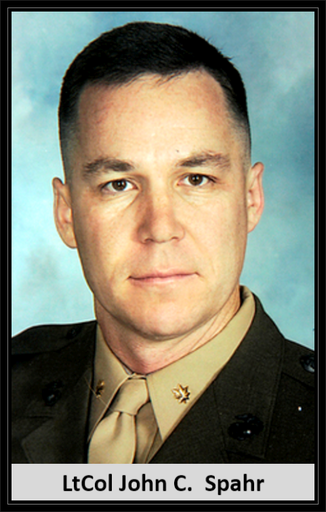 May 9, 2005--Lt. Col. John C. Spahr, 42, of Cherry Hill, N.J., died May 2 from injuries received when the F/A-18 Hornet aircraft he was piloting apparently crashed in Iraq, according to a news release from the U.S. Department of Defense. Lt. Col. Spahr was assigned to Marine Fighter Attack Squadron 323, Marine Aircraft Group 11, 3rd Marine Aircraft Wing, Marine Corps Air Station Miramar, Calif. His unit was embarked aboard the U.S.S. Carl Vinson. A native of Cherry Hill, N.J., Lt. Col. Spahr attended St. Joseph's Preparatory High School in Philadelphia. He earned his bachelor of science degree in physical education studies in 1987 and his master’s of science degree in exercise physiology in 1988, both from the University of Delaware. In 1982 and 1983, he played on the UD football team. Lt. Col. Spahr's personal military decorations include the Air Medal, Navy and Marine Corps Commendation Medal and Navy and Marine Corps Achievement Medal. According to The Philadelphia Inquirer, a few months before his death, he learned he was to be promoted from major to lieutenant colonel, and now the promotion will go through posthumously. He is survived by his wife, Diane, daughter, Chandler, his mother, four sisters and a brother. He will be buried at 11 a.m., Wednesday, May 18, in Arlington National Cemetery. Memorial donations may be made to St. Joseph's Preparatory School, 1733 West Girard Ave., Philadelphia, PA 19130.